A Spanish Talmudist and author; born at Barcelona in the early part of the fourteenth century; died at Narbonne in October, 1393. He was a religious poet and leader of the Jewish community in Gerona (Catalonia), and is praised not only for his deep Talmudic knowledge, but more especially for the disinterested manner in which he performed his functions. It is probable that he left Gerona at the time of the terrible persecution of 1391 and settled in Narbonne. A poem for the Passover service and four poetical lamentations from his pen are preserved in manuscript. 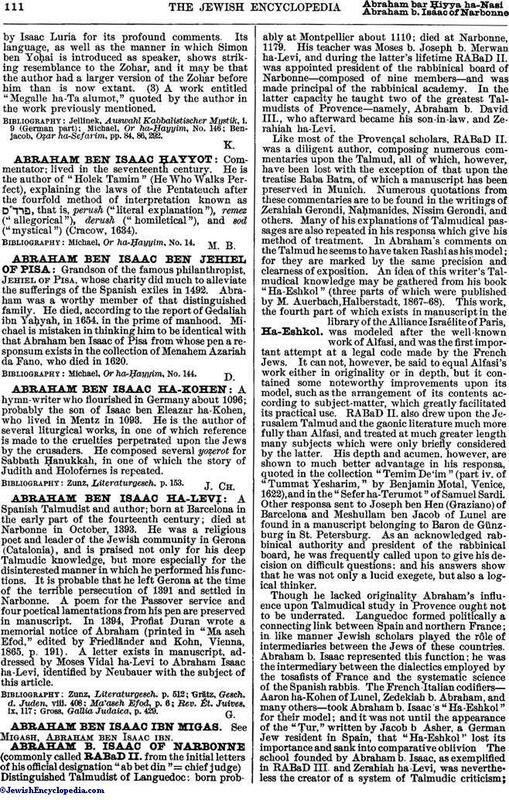 In 1394, Profiat Duran wrote a memorial notice of Abraham (printed in "Ma'aseh Efod," edited by Friedländer and Kohn, Vienna, 1865, p. 191). A letter exists in manuscript, addressed by Moses Vidal ha-Levi to Abraham Isaac ha-Levi, identified by Neubauer with the subject of this article. Gross, Gallia Judaica, p. 429.